The Power of the Image is an eye-opening conversation about the integral role of visual researching in documentary and factual content, with Special Award recipient, Elizabeth Klinck, and award-winning documentary director, Jennifer Baichwal. We’ll discuss the visual researching process, how the intermingling archival footage and stills from past and present can evolve our expectations of the future, and the way a single image can punch a viewer in the gut and change their world view. Of Anishinaabe lineage, Sarain is a dancer, choreographer, activist and television host. Host of Future History on APTN, Anishinaabekwe Activist, Influencer, Performer and Dancer. A storyteller at heart, Sarain combines these various mediums to amplify the voices of her people in hopes of creating meaningful dialogue between her indigenous community and settler communities. 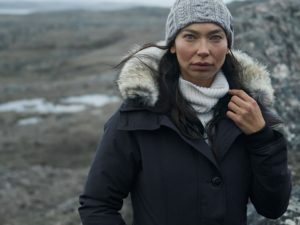 Sarain’s screen highlights include RISE (Viceland), Cut-Off (Viceland) and APTN’s Future History. As a dance artist, Sarain has trained at some of the most highly acclaimed faculties such as Quinte Ballet School, The Canadian Children’s Dance Theatre and Alvin Ailey American Dance Theatre. Sarain has danced with prestigious indigenous dance companies and artists such as Buffy Saint Marie, Digging Roots, A Tribe Called Red, Kahawaii dance theatre (Toronto), Untld. Collective (Australia) and Ajkun Ballet Theatre (NYC). Sarain was the choreographer and lead in Theatre New Brunswick’s’ The Eighth Fire and recently premiered her solo work, The Red Road Block, at Toronto’s Harbourfront Centre. She has been using her dance platform to create meaningful dialogue between her indigenous community and settler communities. Her collaborative work with Xara Choral theatre (Fatty Legs) can be seen as an example of Sarain’s lifelong commitment to art as a tool for reconciliation. Elizabeth Klinck has worked as a producer, researcher and clearance specialist on hundreds of international documentary films that have garnered CSA, Emmy, FOCAL, Peabody and Oscar awards. A graduate of Queen’s University, she has presented masterclasses at numerous international conferences and film schools. 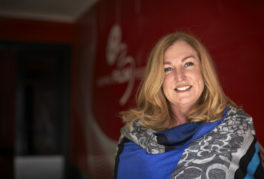 Nominated for an Emmy in the Craft of Research and three times for Best Visual Researcher at the FOCAL UK Awards, Elizabeth has won six Best Visual Research Awards at the Canadian Screen, Gemeaux, and Gemini Awards. In 2008 she was the first Canadian to be awarded the FOCAL International Lifetime Achievement Award. Elizabeth has served on the board of WIFT, Audio Visual Trust, Impact Media Summit, and is the founding chairperson of the Visual Researchers’ Society of Canada. She presently serves on the Executive Committee for FOCAL International (UK) and is a member of DOC Toronto. 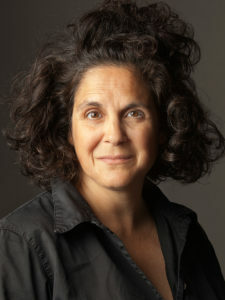 Jennifer Baichwal has been directing and producing documentaries for over 20 years. Selected credits including Let It Come Down, Payback, Manufactured Landscapes, and Watermark, which have played all over the world and won awards both nationally and internationally. Baichwal and her partner Nicholas de Pencier were co-directors of Long Time Running, a feature documentary on the Tragically Hip’s 2016 summer tour. The Anthropocene Project, Baichwal’s most recent collaboration with de Pencier and Edward Burtynsky, includes a major touring exhibition which debuted simultaneously at the Art Gallery of Ontario and National Gallery of Canada, a feature documentary film which premiered at TIFF 2018, an art book published by Steidl, and an educational program.